#FlashChoir 2016 is just around the corner. If you would like to join us, here’s all you need to know. 1/ #FlashChoir is a pop up choir created on the spot by whoever turns up. 2/ There is no rehearsal, all you need is to download the FLASH CHOIR SONGBOOK 2016 and bring it with you on the night. 3/ We walk around the streets of Ossett singing as we go, stopping occasionally to sing in front gardens and in spots of interest. 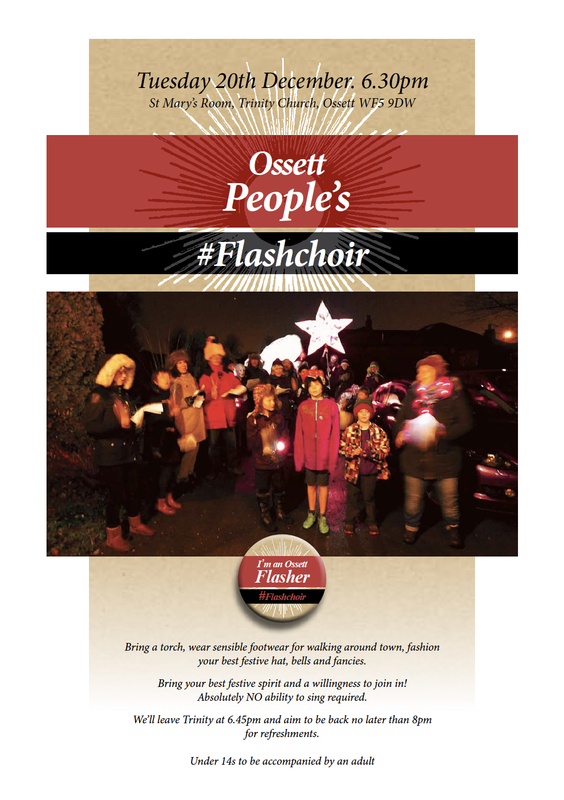 4/ This year’s #FlashChoir is on Tuesday 20th December. We meet at Trinity Church in Ossett at 6.30 and leave at 6.45. We shall walk and sing for about an hour and a quarter before returning to Trinity for refreshments. All done by 8.30pm. 5/ Please wrap up warmly, wear sensible shoes and your best Festive Fancies, battery operated fairy lights, christmas hats, bells, tinsel … it’s your chance to be the Christmas Tree. 6/ This is the fourth #FlashChoir and the weather has not always been kind to us. However we have not yet been beaten so a little bit of rain and wind shall not deter us. If the weather is truly dreadful we have a wet weather option so please do turn out. Lots of love to you Flashers and we’ll see you on the 20th. Massive thanks in advance to Faceless Arts and Musician Richard Ormrod who are giving their time and love for free to this event. Prev: Want A Choir In Your Garden?? Next: More Threshold with Schwa!